LP version. 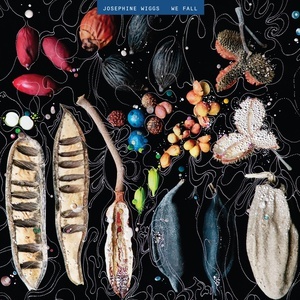 Alt-rock icon Josephine Wiggs is best known as bassist in The Breeders, rising to superstardom in the '90s and continuing to draw crowds and critical acclaim in the wake of their 2018 album All Nerve. But over the years, Wiggs has released several of her own albums, all of which delightfully defy genre. Her new solo record, We Fall, is both a departure and a distillation of an enduring personal aesthetic: moody and spare but also melodic, at once contemporary and nostalgic. Some influences are clear: We Fall is reminiscent of the experimentalism of Brian Eno's Another Green World (1975) and recalls the delicate, languid minimalism of Harold Budd. The album's classical inflections, sharpened by a dialog with electronic elements, evoke Alva Noto and Ryuichi Sakamoto. This is an album of juxtapositions: minimalist at moments, richly layered in others; ambient while also sharply focused; melancholy yet resolute. There's something both dreamy and scientific about We Fall. Wiggs, an enthusiastic amateur mycologist, has an impressive collection of mushrooms she's photographed in her travels. We Fall could be the soundtrack to what can't be captured in a single photo -- the growth and decay of miraculous creatures that a less astute and sensitive eye might overlook entirely. Composed, performed, and recorded by Wiggs, with drums and electronics by her longtime friend and collaborator Jon Mattock (Spacemen 3, Spiritualized), We Fall is a lyrical, bucolic album with an undercurrent of disquiet. Think of a wintertime walk in the woods as dusk falls too soon. True to the classic album form, the ten almost entirely instrumental tracks on We Fall form a compelling whole: a crystalline meditation on paths not taken and words unspoken, an elegy for moments lost and last embraces.